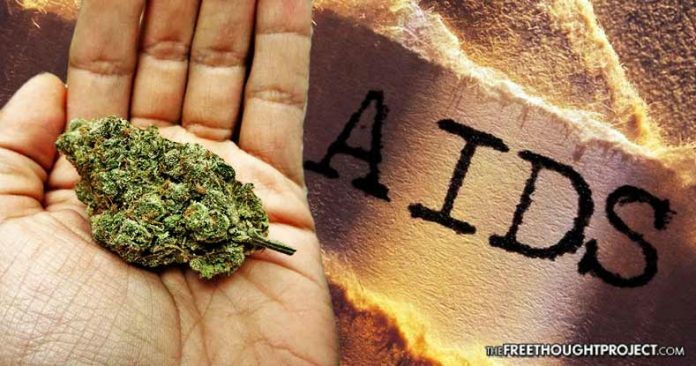 The study, published by the National Institutes of Health, demonstrates the incredible potential of medical cannabis to treat HIV and the injustice of prohibition. With so many studies coming out on the numerous ways medical cannabis can treat health ailments, some of us may have become slightly numb to the wonders being revealed about this beneficial plant. But a new study published in the Journal of Acquired Immune Deficiency Syndromes (JAIDS) might change that. Much of that is Greek to those of us not in the medical field, but the results suggest something stunning. HIV patients taking cannabis have likely helped prevent their condition from turning into full-blown AIDS. This will open the door for medical cannabis to be used for the dual purpose of treating side effects and preventing disease progression. According to HIV.gov, “More than 1.1 million people in the U.S. are living with HIV today, and 1 in 7 of them don’t know it.” Although many thousands become newly infected every year, the rate declined 18 percent from 2008 to 2014. Since the 1980s, over 1.2 million people have been diagnosed with AIDS, with 18,303 diagnosed with AIDS in 2015. 6,721 deaths were directly attributed to HIV in 2014. Although HIV and AIDS cases are declining, they remain a significant problem. Now we find that the cannabis plant may have yet another miraculous benefit in the form of suppressing a deadly disease. The AIDS epidemic began in the 1980s as Ronald Reagan ramped up the drug war. Doubling down on the failure and injustice of prohibition, Reagan and this fellow drug warriors stifled research into medical cannabis and denied the people the healing powers of this ancient medicinal plant. While much progress has been made since those dark days—and the overwhelming majority of Americans now believe medical cannabis should be legal—a fervent prohibitionist now sits as the nation’s top law enforcement official. Attorney General Jess Sessions has vowed to ramp up the drug war once again, relying on myths and falsehoods to justify his warped view of reality. Sessions is now trying to reinvigorate the DARE (Drug Abuse Resistance Education) program put in place by Nancy Reagan in the 80s. Thankfully, most states in the U.S. now recognize the power of medical cannabis and aren’t paying much attention to the ramblings of Reefer Madness politicians like Jeff Sessions. Medical research into cannabis is continuing to grow exponentially, adding to the body of factual knowledge and leaving prohibitionists nowhere to hide.